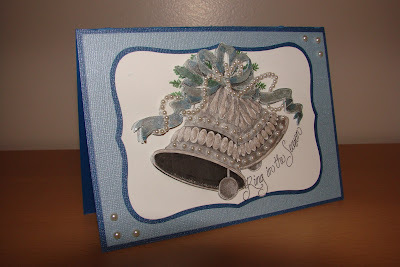 Here is a card that I made back in Canada last month. It features a digi-stamp from Squigglefly called Holiday Bells. This is my first foray into digi-stamps. I started by printing the image onto smooth white c/s three times. I ran the first image through the Big Shot with Spellbinders labels 4 grand. The second and third layers were fussy cut to create a paper tolle look. This was quite fussy around the ribbons and pearls. Definitely not a card design for mass production. To colour the images, I used SU's platinum and frost white shimmer paints. 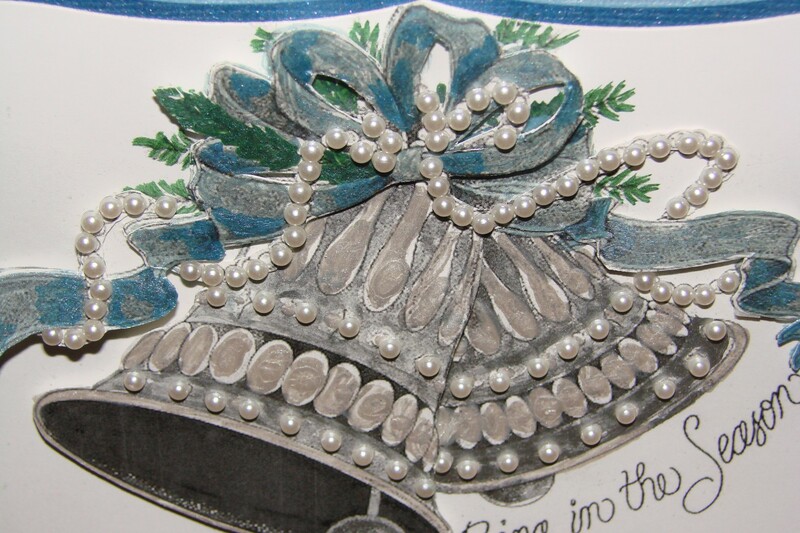 For the ribbon, I added some drops of Not Quite Navy re-inker to the frost white shimmer, and I did the same thing with garden green re-inker for the pine sprigs. Once all the layers were painted (and I did not paint some of the inner areas that I knew would be hidden), I began to put them together using both mini glue dots and dimensionals to get the look I wanted. The card base, light blue layer and mat are all bazzil shimmer papers. 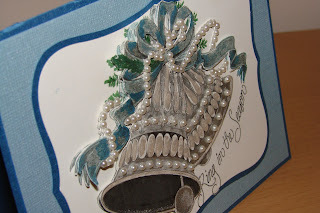 After I had everything put together, I began to add the self adhesive pearls, one at a time, to the pearls on the image, to the bells, and to the corners of the card. This was not a card for the impatient or the rushed, but I had fun creating it.